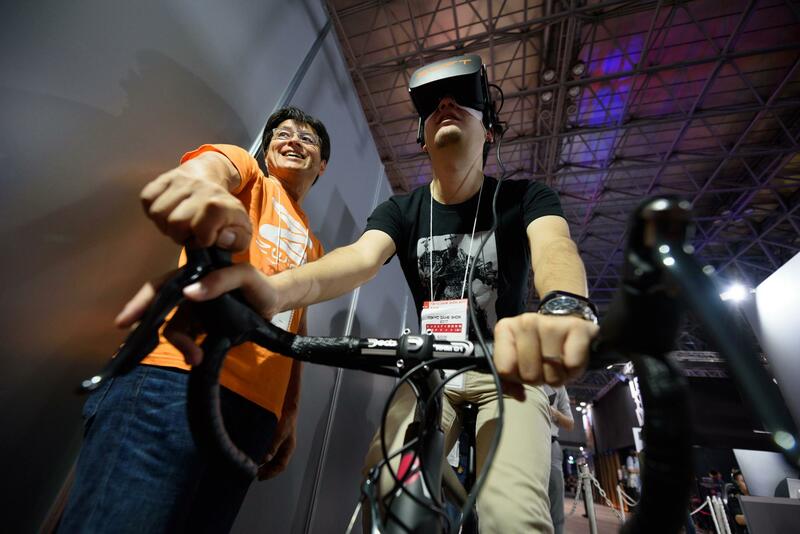 UPDATED: Thu., Dec. 20, 2018, 8:23 p.m.
Zwift, a company that gives cyclists the opportunity to compete in virtual-reality races, has raised $120 million to help them set up an esports league and further their expansion into running. Based in Long Beach, California, Zwift has built software that lets riders simulate outdoor training – such as cycling up a mountain – from their living room. Customers can train or compete against one another, with the race projected on their tablet, laptop or mobile phone, along with data about their performance taken from their training device, such as a bike or treadmill. The new funds will help build up the KISS Super League, Eric Min, the company’s co-founder and chief executive officer, said in an interview. Last week, Zwift announced the formation of the competition with participation from four professional cycling teams. Esports is a rapidly growing industry. This year Amazon.com Inc.-owned Twitch announced a two-year deal to stream Activision Blizzard Inc.’s Overwatch game, worth an estimated $90 million, while software giant SAP SE has been sponsoring esports to reach potential hires. The world championship finals of League of Legends this year featured two squads battling it out at a 50,000-seat stadium in the South Korean city of Incheon. Zwift’s funding round was lead by Highland Europe, a venture capital firm based in London, where the startup also has an office. True, a London-based investment firm that specializes in backing retail and consumer brands, and Causeway Media Partners, a Silicon Valley and Boston-based company that invests in sports-related technology and media, also participated. In addition to creating an esports league, Zwift plans to expand its current offerings for treadmills and may consider moving into new sports, such as rowing, Min said. It will also roll out products in more local languages. Currently, Zwift has users in 150 countries, Min said, but is available only in English. Min said that creating an esports season using Zwift’s platform would be good for professional cycling, creating additional opportunity for sponsors to get exposure and providing the athletes further training and competition opportunities at a time of year – from late-winter to early-spring – when there are few outdoor road races. A former J.P. Morgan investment banker, Min previously founded Sakonnet Technology, an electronic trading and risk management platform for commodities traders. He said he decided to found Zwift in 2014 because of his own passion for cycling and his frustration, after moving to London from New York in the late 1990s, that he could not find a social network of cyclists similar to the one he trained with in New York City’s Central Park. Published: Dec. 20, 2018, 9:37 a.m. Updated: Dec. 20, 2018, 8:23 p.m.